BIG NEWS for BIG WAVES on BIG WEDNESDAY! 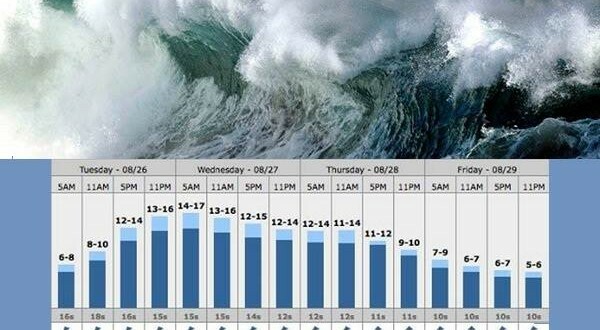 We will likely see over 25 foot waves at the Wedge from WED-FRI, thanks to Hurricane Marie being just 800 miles off our coast. Will this mean tubes? Not counting the “double stacked” waves at the Wedge, our other beaches will be seeing waves from 7 to 10 feet along south-facing beaches starting Wednesday, with occasional sets of 12 to 18 feet. BEWARE: There will be very intense rip currents on these days, so please remain safe! Photo credit to Allen Schaben, showing Newporter Bobby Okvist as a human rocket.